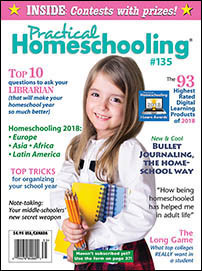 Homeschool World: Request a Free Issue! Sorry, we are all out of free sample copies of this issue. The remaining copies are reserved for new subscribers. If you requested a free issue in the last month or so and met the requirements (you live in the continental USA and your household has not requested an issue in the last two years), your copy should be included in a batch that will ship in a couple of weeks. Please allow 1-3 weeks for the Post Office to deliver it.